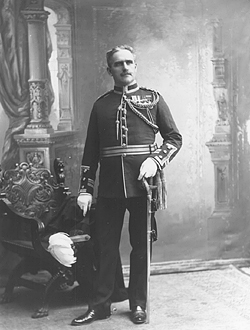 Lieutenant-Colonel Sam Hughes in 1904. Sam Hughes was a senior militia officer and an influential Member of Parliament for the Conservative Party. An intensely patriotic, strong-willed man, he disliked professional soldiers. An unauthorized effort to raise his own brigade for service in South Africa, and a public argument with the general officer commanding the Militia, ensured he did not get a position in the first contingent. The Department of Militia and Defence, however, allowed him to accompany the contingent in an unofficial capacity. Once in South Africa, Hughes managed to get an appointment with Brigadier-General Herbert Settle's column in the Karroo expedition. Hughes distinguished himself at the capture of Upington. In May and June 1900, he served in Sir Charles Warren's column in Griqualand. Here again, Hughes performed daringly, though perhaps not to the extent he believed. He later claimed, but was never able to prove, that British officials had promised him no fewer than two Victoria Crosses, Britain's highest decoration for valour in battle. In the summer of 1900, the British high command dismissed Hughes and sent him back to Canada. Letters in which Hughes charged the British military with incompetence had been published in Canada and South Africa. Hughes had also flagrantly disobeyed orders in a key operation by granting favourable terms to an enemy force which surrendered to him. Although Hughes had proved a competent, and sometimes exceptional, front-line officer, boastfulness and impatience told strongly against him. When the Conservatives took power in Ottawa in 1911, Hughes became Minister of Militia and Defence. Though his planning was often haphazard, his energy and devotion largely accounted for the swift mobilization of Canadian troops for service overseas during the First World War. Once again, however, his abrasive character alienated many people and caused administrative chaos. The Prime Minister dismissed him from the Cabinet in 1916.